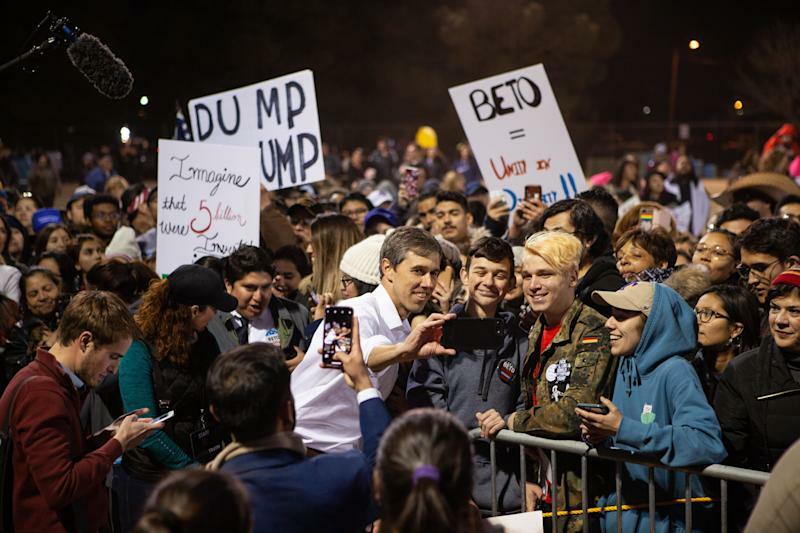 Three months after his surprisingly close defeat by Sen. Ted Cruz, R-Texas, in a closely watched U.S. Senate race, Beto O’Rourke bounded onto a stage in his hometown of El Paso on Monday night, before a wildly cheering crowd of as many as 10,000 people. It was the first major public appearance since the election by the former Democratic congressman. He has maintained a low profile since November, save for a string of Facebook and Instagram videos and an online diary posted on social media, in which he seemed to be restless and searching for what to do next. For many of the hundreds of thousands of supporters from all over the country who backed his unlikely bid to unseat Cruz, writing checks and volunteering for his campaign from afar, the answer was obvious: Had he won, he would have been a natural candidate for president. Having narrowly lost, he should run anyway. After flatly ruling out any interest in a White House bid right up until Election Day, O’Rourke has slowly reversed himself, inching closer and closer to a bid for the Democratic nomination -- so close that he found himself sitting across from Oprah Winfrey in New York last week coyly admitting that he was “excited at the prospect” of a potential run but hadn’t quite decided yet. “By God, when are you going to know the answer?” Winfrey exclaimed. Not as soon as Monday night, it turned out, even though the setting seemed tailor-made for an announcement. 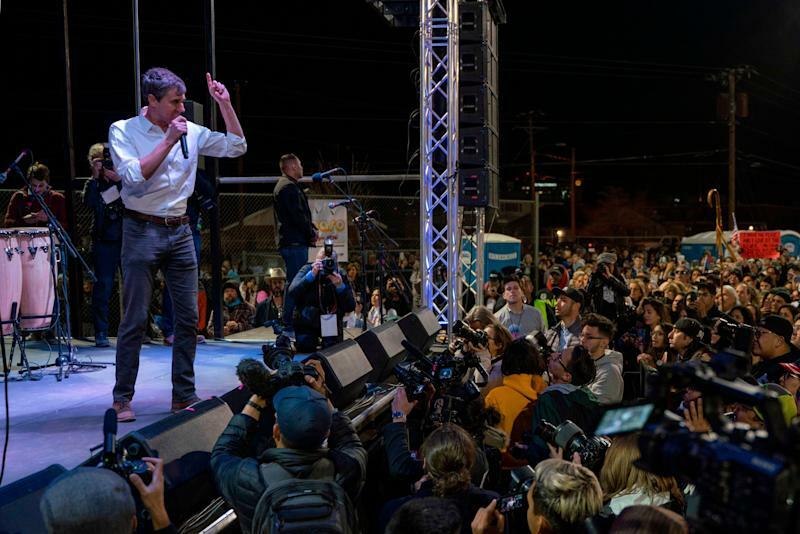 The star attraction of a counterprotest to President Trump’s El Paso rally, where the president was campaigning for his beloved border wall project, the lanky, 6-foot-4 O’Rourke, lit by camera lights like a moving Statue of Liberty, stood out in the sea of people marching from the heart of the city to a site just south of the Trump MAGA rally. Volunteers formed a human chain around O’Rourke and his family—his wife, Amy, and their three children—as they were mobbed by reporters and well-wishers. Around him, people waved signs that read “Beto 2020”—including one fashioned after the simple black and white logo of his failed Senate bid. On a live stream of the event, people could be heard shouting for O’Rourke run. “I’m thinking about it,” the former congressman told one man—the same answer he gave to several reporters who waded through the crowd to press him on his White House aspirations. Privately, those close to O’Rourke offer nothing further than that. “He’s thinking about it,” one close associate said Monday, asking not to be named. O’Rourke’s deliberations about his future have been confined to a small group of family, friends and trusted advisers, including his former congressional chief of staff, David Wysong. The discussions have been so closely guarded that some former staffers say they feel hurt that they have been excluded. Friends of O’Rourke say the dynamics shaping his thinking about running haven’t much changed since his first musings in November. His main consideration is the impact of a race on his family, especially his three children, Ulysses, 12, Molly, 10, and Henry, 7. Although his wife, Amy, was supportive of his Senate run, O’Rourke missed her during a campaign in which he spent the better part of two years on the road and felt guilty that his political ambitions had rendered her almost a single parent. Although she is said by those close to the family to be “positive” about her husband’s potential White House bid, a 2020 race would no doubt be tougher. Campaigning for national office would take him away from home for longer than a statewide race. In an already crowded field of Democratic hopefuls, there are still no signs that O’Rourke is assembling the kind of political machinery required for a serious presidential bid—although some grassroots activists are doing it for him. But it’s still unclear exactly what a Beto 2020 campaign would look like. Those close to O’Rourke say they believe he would prefer to run the same kind of campaign for the White House. But what (nearly) worked in a single state, even one as big as Texas, might not be feasible on a national scale. O’Rourke’s appearance this week suggested he at least has an idea of how he might frame a race against Trump, if he gets past more than two dozen other Democrats said to be considering entering the primaries. A little over three months since he conceded the Senate race to Cruz at a rally held at the minor league baseball stadium downtown, the former congressman re-emerged Monday as if a day hadn’t passed. 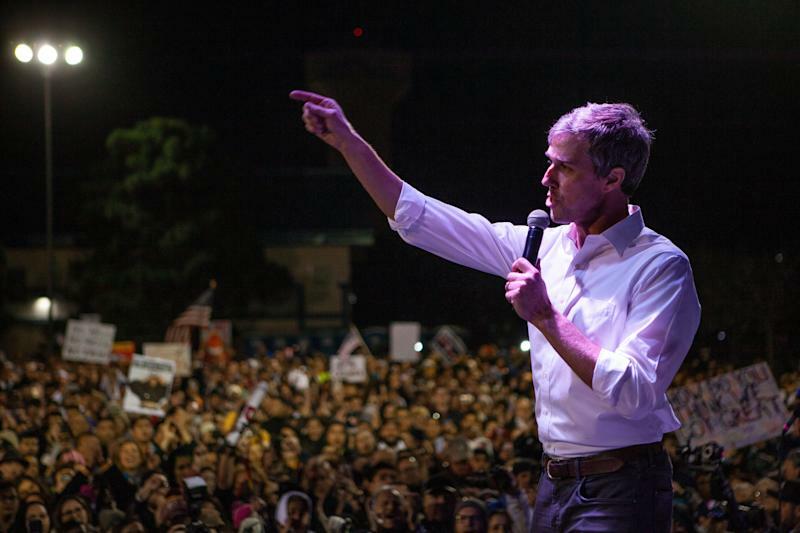 Dressed in his usual campaign uniform of jeans and a button-down white shirt, O’Rourke took the stage outdoors less than a mile from the El Paso Coliseum, where the Trump rally was held—close enough to hear the president’s blaring campaign soundtrack of hits from the Rolling Stones and Lee Greenwood in the background. O’Rourke, speaking a few minutes before Trump began, delivered a fiery call for his fellow El Pasoans to rise above “lies and hate” propagated by the president and his allies, who have characterized the city as a formerly violent, crime-ridden place that has only become livable since the construction of a fence separating it from Mexico. 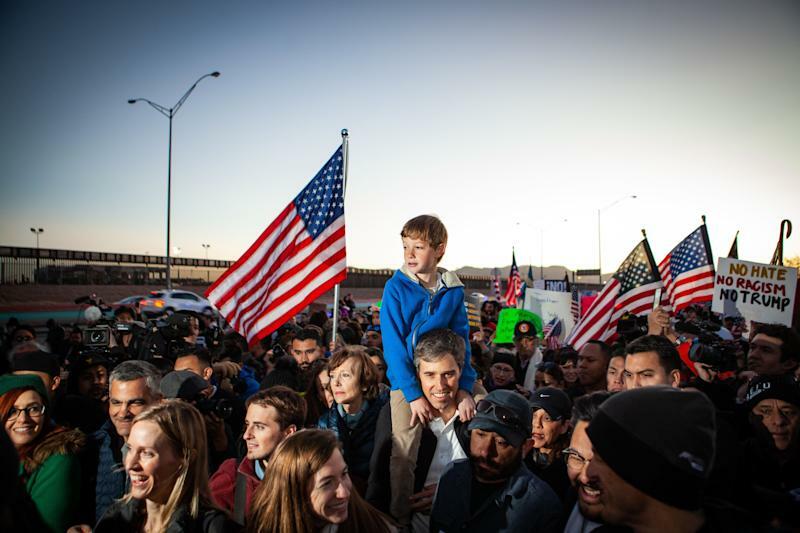 Echoing others in the city, including El Paso Mayor Dee Margo, a Republican, O’Rourke pointed to statistics showing that the city has been among the safest in the country, even long before a barrier was built separating the city from Juárez. "With the eyes of the country upon us, all of us together are going to make our stand, here in one of the safest cities in the United States of America -- safe not because of walls, but in spite of walls," the former congressman declared. "We treat each other with dignity and respect. That is the way we make our community and our country safe." As in his Senate race, where he rarely mentioned Cruz or Trump on the stump, O’Rourke never once mentioned his prospective opponent by name. But he repeatedly took shots at Trump’s posture and policies, including his inflammatory rhetoric about immigrants and his threat to declare a national emergency to build a wall. O’Rourke argued that the move would allow the president “to subvert an equal branch of government” for a wall that would have no real impact.